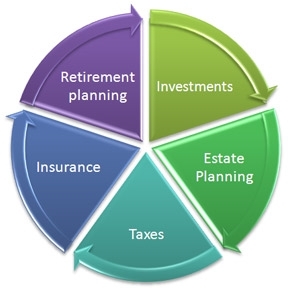 In today's uncertain economy, financial planning has become increasingly important. With an overwhelming number of options for saving and investing, managing your finances can be difficult. Creating a financial plan can help you see the big picture and set long and short-term life goals, a crucial step in mapping out your financial future. When you have a strategy and a financial plan, it's easier to make financial decisions and stay on track to meet your goals. Working with a CFP® professional can help you to secure your financial wellbeing, give you financial confidence, and help you pursue financial planning success. Every financial decision you make can affect several other areas of your life. For example, an investment decision may have tax consequences that are harmful to your estate plans. Or a decision about your child's education may affect when and how you meet your retirement goals. Remember that all of your financial decisions are interrelated. That is why we encourage clients to take a step back to view the big picture, instead of focusing on each financial decision individually. Click on each piece of the Financial Planning Pie to learn more about some of the major aspects of one’s financial situation.